Total townhouse construction increased slightly on a year-over-year basis during the second quarter of 2013, per Census data of Starts and Completions by Purpose and Design. 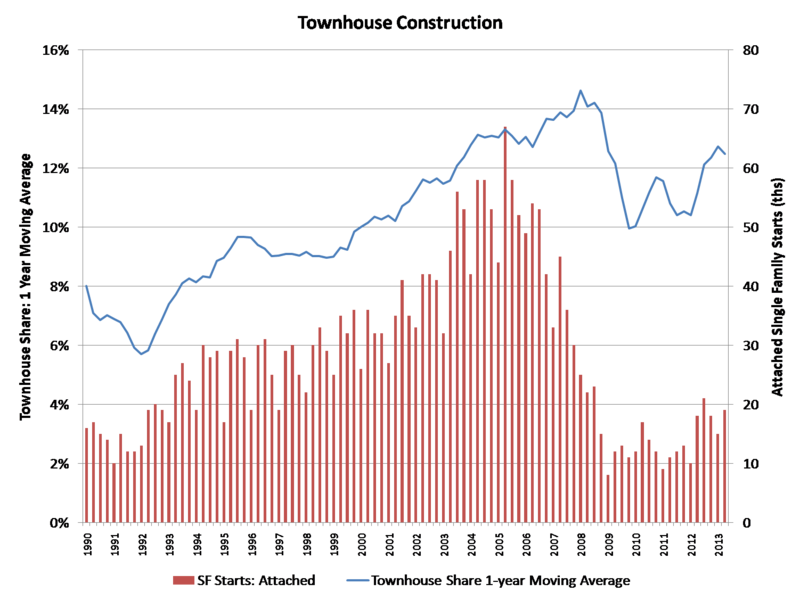 Single-family attached starts totaled 19,000 for the quarter, compared to 18,000 during the second quarter of 2012. Over the period spanning the third quarter of 2012 through the end of the second quarter of 2013, 73,000 townhouses began construction. Using a one-year moving average, the market share of townhouses now stands at 12.5% of all single-family starts, up from 11.2% for the second quarter of 2012. However, this share is down slightly from the first quarter of 2013, which set a post-recession cycle high of 12.7%. Despite the drop in market share during the Great Recession, I expect the share for townhouse construction to increase in coming years with occasional ups and downs. For example, the market share may dip somewhat in the near term, given the ongoing rebound in the overall single-family construction sector. Nonetheless, the prospects for townhouse construction are positive given large numbers of homebuyers looking for medium density residential neighborhoods, such as urban villages that offer walkable environments and other amenities. This entry was posted on Monday, August 26th, 2013 at 2:05 pm and is filed under Data. You can follow any responses to this entry through the RSS 2.0 feed. You can leave a response, or trackback from your own site.